Lawn sprinkler systems are going green. Besides just helping to keep your lawn a deep dark shade of emerald, automatic lawn irrigation systems (as professional landscapers call them) offer special eco-friendly features to conserve water. This is good news for everyone who is tired of hassling with a manually operated sprinkler … or even worse, a hose, to supply their turf with the water it needs. Even the common pop-up sprinkler systems are now being replaced by programmable versions for more efficient water use. Consider your lawn. An automatic sprinkler system is best suited for a medium to large area, with adequate drainage. If your soil is compacted or high in clay, you may wish to modify it or use another method of watering. Consider your budget. Look at the total cost of any irrigation system you are considering. Take into account the initial purchase price including design, equipment, and installation (which will run approximately $2500-8000 depending on the size of your property). Then add in water usage plus the cost to maintain and repair the lawn sprinkler system for a more accurate picture. Consider your local regulations. You are likely to need a permit before you start digging in preparation for the lawn sprinkler system install. You will definitely have to find out whether there are any electricity cables or gas lines buried in the area where you'd like to install the system -- contact a one-call center to find out. In addition, check out any water restrictions in your area and make sure that your system will conform. Just as programmable smart home systems has been developed for the indoors, there are now smart garden systems as well. You can buy a highly intelligent lawn sprinkler that may be programmed to turn the flow on and off at the specific times you choose, in order to optimize water usage. Your lawn irrigation system should include a rain sensor shut-off switch that overrides the timer, so that it doesn't operate when it is needed the least ... in the middle of a cloudburst. Some states have passed legislation making this a mandatory feature. To conserve water even more, the sprinkler system can also be fitted with a soil moisture sensor. Another type of programmable sprinkler system can be set to spray only within your lawn's exact parameters, reducing water wastage through over-spray onto pavements or other unnecessary areas. It is even capable of watering around corners. And what about the problem of varying amounts of sun? A section of your yard that is exposed to strong daylight for many hours a day will obviously need more water than an area in deep shade. 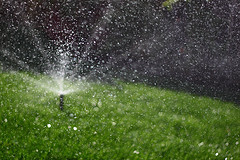 You can program your sprinkler system to provide a shorter watering time to the shaded part. Set up your system to water between 5 and 10 AM. This will allow the moisture to soak into your lawn. Watering during the heat of the day, that is, in late morning or afternoon, will cause inefficient use of water due to stronger winds and a faster evaporation rate. Irrigation in the evening is also undesirable because the water will be absorbed too slowly, potentially resulting in molds and plant diseases. Check the lawn sprinkler system occasionally to make sure it is directed correctly and has not become clogged. Adjust the settings as the seasons change and with them, your lawn's requirements. Combine the use of an efficient irrigation system with a conscientious lawn care program. This may include verticutting (cutting the lawn vertically to prevent thatch buildup), mowing with sharp blades set to 2 1/2 to 3 inches, and mulching. Think about devoting a part of your yard to xeriscaping, growing drought-tolerant plants which demand minimal watering.